More and more Japanese tuners lovingly take care of the new Suzuki Jimny . The Tokyo Auto Salon 2019, Japan’s tuning fair par excellence, shows the full range: from the monster truck over a G-class copy to the Land Rover clone. The Japanese tuners have a new favorite object: the Suzuki Jimny . After DAMD had already turned it into a small Mercedes G-Class or a Land Rover Defender (see below), Wald International followed suit with its program. Even cult tuner Liberty Walk has already designed a body kit for the little off-roader. The first impression: The Japanese used the parts for the G 63 AMG directly secondarily. The Shibata R31 House is actually specialized in performance conversions of the Nissan Skyline. But for this year’s Tokyo Auto Salon, the Japanese are unfaithful. Not only have they built a car that is guaranteed to have lost nothing on a race track – it is also a foreign brand. Which model it is, it should be clear, after all, it is not in vain in this tuning overview to Suzuki Jimny landed. But with what consistency Shibata the cuddly SUV to Monster Truck has rebuilt, is truly impressive. It took a stately uplift by sub-frame by 40 centimeters to get the giant beadlock wheels with coarse-grained tires under the car . Moreover, not much has changed on the Jimny body. So far, the same applies to the engine compartment, in the foreseeable future but a Nissan V8 move. 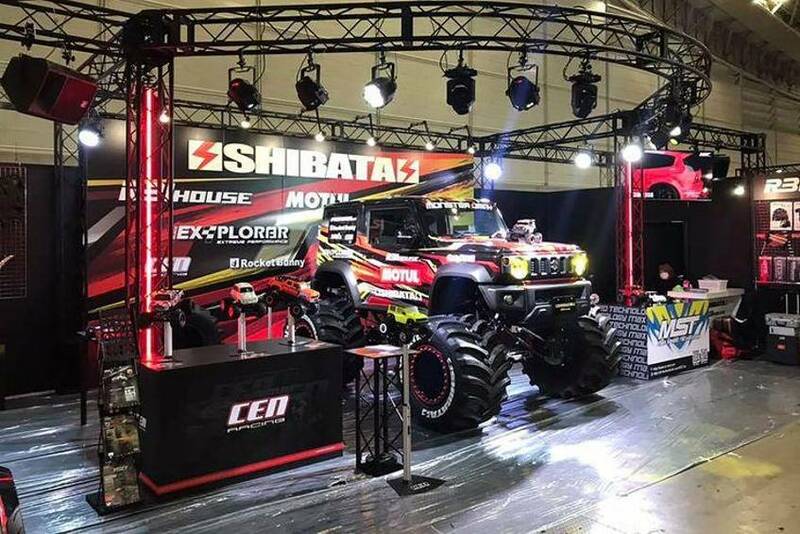 As if that were not enough, Shibata has teamed up with CEN Racing for its trade show presence . The Americans deliver the very detailed radio remote controlled counterpart to the real monster Jimny in the scale 1:12, which comes in March even in the trade. There are also striking similarities in the Suzuki Jimny by Liberty Walk . Not to a toy car, but to the Mercedes-AMG G 63 from that same house. The bumper has almost the same hexagonal air inlets on the sides. Also, the grille with the two cross struts with Liberty Walk logo reminds of the Mercedes , just like the angular fender flares. Only the turn signals show a difference: The G 63 AMG they sit typically on top of the fender, the Jimny laterally offset next to the headlights. The parts mentioned so far belong to the bodykit called “G Mini Works Light”, which costs $ 2,970 (currently about € 2,585). Those upgrading to the complete package, which also includes a rear wing, will pay $ 3,510 (around € 3,050). But only the premium package makes the G 63 AMG look perfect. It also includes the striking front roof spoiler with LED lighting and the bonnet attachment. Cost: $ 5,570 or 4,850 euros. Wald International does not promise too much with its name “Black Bison Edition”, after all the Jimny makes a truly impressive appearance after his transformation. Who feels reminded of the Mercedes G 500 4×4², is not entirely wrong. This is especially true from the front and is not only due to the new grille with ten longitudinal struts, from which the headlights are now optically separated. Or at the new front bumper with its four-part LED lights. But primarily on the new hood in the air scoop style, the attached turn signal à la Mercedes G-class carries. The attachment at the front end of the roof, which is also home to some LED lights, makes the pithy look perfect. Rear changes – apart from the flattened roof spoiler – not so much. Subtle optical retouching operates forest at the spare wheel cover and at the side ends of the rear bumper, which are adapted to the widened fender towers. Underneath, seven-spoke wheels rotate with generously sized coarse-grained tires, and they also have plenty of room thanks to their massive height adjustment. The prices for his Black Bison program announce Wald later. Competitor DAMD has styled his “Little G” body kit a bit more decent, but makes no secret of the fact that the design of the Mercedes G-Class has been taken as its model. For example, there is the front: Instead of five vertical air intakes, there is a grille with a thick cross strut, in the center of which emblazoned a round logo that could well present a star. The bumper now shows the blocky tripartite division that we still know from the G 55 or G 63 AMG. Even the central underrun protection is reproduced by DAMD, albeit in a slightly shirt-sleeved style with perforated sheet metal. The round Jimny turn signals replaced the tuner by vertically arranged signal lights. The at Suzuki’s beveled original fender flares are straight when DAMD Jimny; it is similar in the G-Class. In between there is a running board, under which the funniest detail emerges: double tailpipes designed as a side pipe, as the G 63 AMG still has today. The narrow twelve-spoke rims and the rear-mounted spare wheel cover in G-class optics make the illusion perfect. Well, at least almost. Where DAMD ever was at the head, sorry, citation, they have the Jimny transformed directly into the reincarnation of another SUV icon. It’s not hard to guess who the “Little D” is referring to: Sure, to the Land Rover Defender . Again, the tuner has changed the radiator grille and the bumper, also redesigned the hood. Everything remains the same on the side, apart from the rugged-looking rims with its robust off-road tires. The spare wheel attached to the tailgate carries no cover on the Little D – this is the case with the Defender . The rear bumper with the typical round lights also looks like the British model. And what are the sidepipes at Little G, here are the splash flaps behind the wheels. Simply an expression of the attention to detail that DAMD exercises in his Jimny alterations.